Two years from now, no one will remember the details of Senator Ted Cruz’s floor speech. They will not remember the continuing resolution. They will not remember his curious vote to end debate a day after saying he would vote against it. All they will remember is that he spent twenty-one hours speaking out against Obamacare. For standing in front of the country and spotlighting the festering hulk of the legislative haunted house known as Obamacare, Senator Ted Cruz is considered an outlier and a belligerent extremist. And that’s just what his fellow Republicans are saying about him. Other pundits have complained that this distracts from Obama’s current unpopularity. Daniel Henninger in the Wall Street Journal insists that Obamacare will collapse under its own weight and people will have the epiphany that Big Government is a failed experiment. Where have we heard this before? Where have we heard that Obama’s defeat was “baked into the cake?” That his candidacy for President would collapse under the weight of a failing economy? Either the economy wasn’t failing or the implosion theory is bunk. You decide the answer to that one. Yet they’d have us again adopt this mindset. Once more into the breech. I get why Karl Rove and his friends are bashing Cruz. 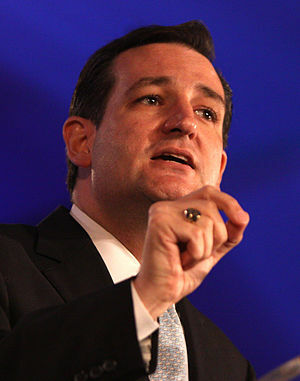 Cruz is the biggest threat to whatever establishment candidate Rove intends to back in 2016. Also, Obamacare is a great fundraising tool and wedge issue for his SuperPAC, similar to how Democrats use immigration reform. Jonah Goldberg’s critique is particularly cloying because of his past complaints that Republicans telegraph their positions and tactics too readily. With his vote today to end debate on the continuing resolution, Cruz clearly never intended to shutdown government. This was never about shutting down the government, as Cruz reiterated countless times throughout his floor speech. If it had, then Cruz would have engaged in a true filibuster. So which is it? Bluff to gain maximum attention for his position or explain ahead of time that he’s just kidding but will go through the motions? Ted Cruz did the former, and the non-insiders around the country rallied to him. Because they aren’t stupid. They understood what this was about. It was about giving people a voice in the halls of the Senate. It was about taking all the words of conservative publications, bloggers, and citizens that skate across the internet as so many ones and zeroes and give them physical form in the chamber where the consequences of the myriad policy conversations matter most. This was about protesting complacency. About not just going through the motions. About making the effort that an elected official should make to stand in place for the citizens he or she represents and doing everything in his or her power to fight for the constituent. If every Senator who came from a state opposing Obamacare felt the same way, then Cruz wouldn’t have had to talk for over twenty-one hours, and kudos to the few Republican Senators and Representatives who either pitched in or sat through the entire speech. As for the other Republican Senators who were nowhere to be seen, why wouldn’t they want a harsh, searing spotlight on what Senate Democrats are about to do? The focus should have been all on Obamacare, but instead the GOP’s fumbling appeasement philosophy made it about them. To some extent, I can understand how all these pundits and politicians can be so clueless and out of touch. They live in the weeds. To them, the toads and dragonflies of the DC swamp are epic. Tactical cunning is the only way they think they can overcome these beasts. Survival is the order of the day, with no larger vision toward leaving or draining the swamp. In the movie Braveheart, William Wallace races in to the battle and gives spine to the warriors fleeing the battlefield as their Scottish lord pleads with them not to leave until they’ve negotiated with the English king. The entire country was ready to rally to Wallace’s side until he was betrayed by those he had helped most, who negotiated his betrayal for greater personal fortune. This time around, Senator McCain filled that role. Near the end of Cruz’s floor speech, when Reid asked Cruz to yield the floor for fifteen minutes so that McCain could bash Cruz in Reid’s place, it was a metaphor for everything that average Americans hate about Washington. What this fight is ultimately about is retraction of the kingly powers of the executive branch and the docile group of nobles in Congress who accede to the king’s every wish while pretending to fight for us. Supporting Cruz was supporting this notion. Of course, that isn’t a message our lordlings wanted to hear. That’s why it’s up to us to #MakeDCListen. This entry was posted in Daily Breakdown and tagged John McCain, Jonah Goldberg, Karl Rove, ObamaCare, Patient Protection and Affordable Care Act, Ted Cruz by frick. Bookmark the permalink.